On that first dark Christmas morn. Starts again in April next year. Merry Christmas one and all and all the very best for 2014! Here's something unexpected to brighten up the winter days. My younger son Olly, whose work you can enjoy here, has been out in Hong Kong and China for an architectural exhibition. Like all faithful members of my long-suffering family, he keeps an eye out for anything smallish and with four wings. 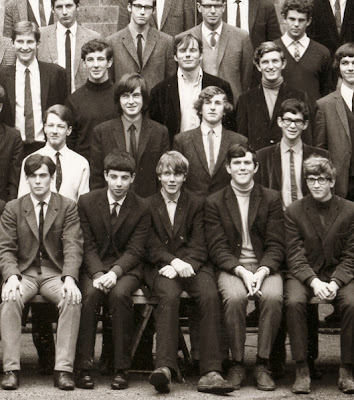 (I recall my older son Tom, father of our lovely new Emily Maheshwary, celebrated in my last post) spotting a Lime Hawk just down the road from here, on a wall in Walton Street opposite the Oxford University Press when he was a student). Olly's find was this lovely butterfly, spotted twice. First, at the top, clinging to a wall on a street in busy Kowloon and secondly, as Olly says, "fluttering around the terraces of the amazing Chai Wan cemetery carved into the slopes of Hong Kong island." He reports further: "It's called the Red-base Jezebel (Delias pasithoe) and it brings people joy, hope and youthful vigour according to this site - http://butterflyclub.greenpower.org.hk/eng/article.php?id=6" It isn't entirely alien to us Brits. You can often see them in butterfly houses including, I think, the one just up the road at Blenheim Palace. 'Cos little bits of Jezebel were clinging to the wheel. I'm not going to make a habit of this, in these dark, cold and unrewarding times for moth trappers, but I had a special reason for shining the lamp yesterday. The world's latest Wainwright and out first grandchild, Emily Maheshwary, has been born and is a sparkling new presence in our lives: very new, very wee but very wick. She and her proud and lovely Mum and Dad are all well. The trap saw an arrival in her honour: this December Moth which snoozed in its eggbox before exploring its surroundings as Emily will do in due course. It was nicely apt that these included a flower beloved of many small children, the Virginian Stock, whose pastel blooms, looking like so many Dolly Mixtures, have somehow survived a succession of recent frosts. Welcome Emily! Many more, wonderful moths await you. Before long, we'll light the trap together. I lit the lamp last night for the first of my occasional off-season checks and was well-rewarded by a series of six finely-clad December moths. They are going to need their fur coats according to my mother-in-law's Daily Express which I used as a photography backdrop, although that paper tends to get a bit over-excited where the weather is concerned. 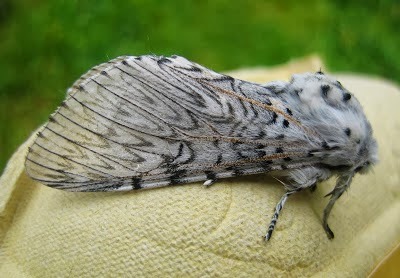 Interestingly, although the 'fur' looks worthy of Lara Antipova at first glance, the wings of the December Moth are unusually translucent because they have fewer scales than most comparably-sized moths. I hope to discover the reason for this, if anyone entomological has established it. The Decembers are timely, with our Advent calendar burning away picturesquely at Number Two, although they were about in early November when I called time on regular trapping. A little more surprising is the presence of three other moths, below: two Chestnuts and a hardy member of the Carpet tribe (I cannot tell which). As you can see, my December Moths vary in size. Unlike the norm for humans, the larger ones are the females - see the contrasting pair below. These also lack the feathered antennae of the males but the moths were so sleepy and the early morning so cold that I didn't have the heart to goad them into showing the difference for my camera. So this is it, dear reader. Cold, wet, darkness and the paucity of moths mean the end of full-scale trapping for 2013. Penny will be relieved to have the chance to talk about something else. It has been as sensational a year as I expected with our move from Leeds to Oxfordshire; not so much in overall numbers or even variety of species, but thanks to the almost daily succession of novelties which are the main fascination for a sadly unscientific but curious amateur such as myself. I was lucky. I saw only the one and on one night only. 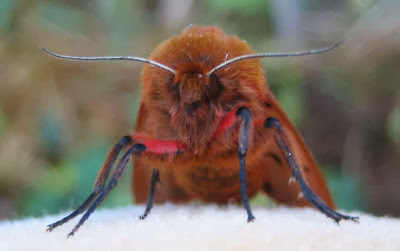 A fellow enthusiast-comments on the Upper Thames Butterfly Conservation website that he has heard 'murmurs' of a merveilleuse année for the moth but has not experienced that himself. It may be categorised as 'common' but it rations its appearances and I am grateful that one of them was for me. 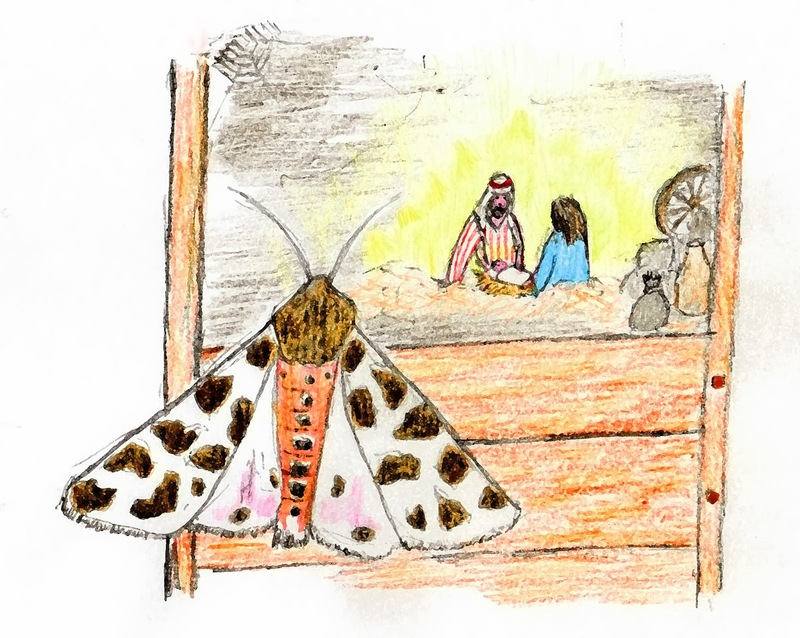 Update: I am very chuffed that the writer and general expert Gillian Darley has Tweeted that my moth looks like 'a mad chenille tablecloth' - a very appropriate description what with 'chenille' being the French for caterpillar. I learned that as a boy on family holidays when I enlisted passing Francais in my chenille hunts. The textile etymology is here. 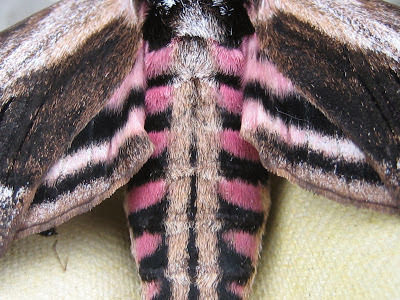 The runner-up is that magnificent creature the Privet Hawk Moth, the largest of the UK tribe that any of us are likely to see. Only the Death's Head and Convolvulus bigger are bigger. I am specially pleased by the circumstances surrounding my first-ever meeting with one: as well as lovely surroundings, we are blessed in our new home with specially nice neighbours and, on learning of my moth mania, one of them dug out an old photo he'd taken of a Privet Hawk, complete with a ruler for scale. The real thing arrived just a few days later. The bronze medal should in fairness be shared by many lovely moths but I have plumped for one, familiar to me in Leeds but glowingly beautiful here, especially when shown against a background of my famous trap-inspecting pyjamas. Lempke's Gold Spot is a dazzling little creature. Update: sorry - see Dave's comment below; this will be a standard Gold Spot rather than Lempke's. Many thanks D. Only the Gold Spangle beats it in my estimation; and that remains a star of the north, at least for now. I have gone on long enough - a feature of the blog which has grown in posts from 100 in 2008 to 123, 134, 158, 165 and now 196 so far this year. It will probably reach 200 by New Year's Eve because I will light the lamp in a desultory fashion between now and April. But in the meanwhile, very many thanks to everyone who has dropped in, to those who have kindly commented and especially to my regular experts who try again and again to keep my dodgy IDs on the straight and narrow. There were no new moths in the trap last night, the first time that this happened this year; just the frail-looking November Moth featured yesterday which had decided to spend a bonus 24 hours in its eggbox cone. It therefore seems a good moment to hold another of my occasional Good Housekeeping exercises and bring my audit of this year's moths up to date. When I last looked through the blog, on 31 July, the tally was 163 species, 138 of them macro-moths and 25 micros. Now those last two figures have risen to 207 and 54, making an overall total of 261 species during this first season of trapping in Oxfordshire. This compares with my grand total in Leeds of 205 species, between starting this blog in May 2008 and closing down at the end of last year, although the discrepancy is not as great as might at first appear. Most of both totals, in Oxfordshire as in Leeds, can be expected in the first year with much smaller accretions subsequently. Both tallies are also modest when compared with others' counts. The excellent moth section of Upper Thames Butterfly Conservation's website has now reached 956 species with an expected boost from micros still to be sorted which could take it above 2011's impressive total of 1058. I know that I under-report because of my impatience and ignorance regarding small and middle-sized grey and brown macros and all but the most vivid micros; but clearly I have plenty to hope for in the coming years. My tentative forecast of moth-rich warmth last night has proved predictably optimistic. We are going through a cycle of mild-and-wet taking turns with clear-but-cold and last night proved the latter. Not that I'm complaining, in the context of today's footage from the Philippines and a fascinating article in the latest National Geographic about Tornado Alley in the States. The moths were few and deeply huddled into eggbox cones, as with the frail-looking November Moth in the first picture. 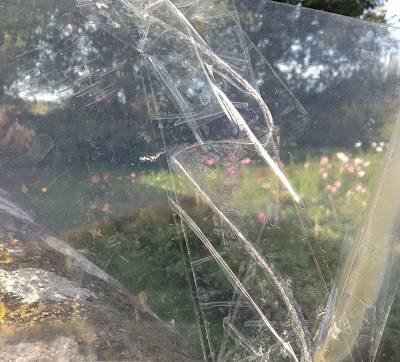 The second was also snuggled right at the tip of a cone, but I broke its cosy nest gently open because it is the second main form of the Satellite Moth, following the arrival on Monday this week of the first type. The little alien spaceship on this version is an orangey-brown, as you can see in the close-up. I've also put a small version of Tuesday's white form on the right, for contrast. Elsewhere in the trap there was only this Yellow-line Quaker - or is it another fading Brick Moth? - on the dewy rim and a slightly less boring micro than Wednesday's pair inside the bulb collar - apologies for the blurring but I couldn't get the camera closer. It was like a large hotel where no one much is staying. Another indicator that the season is drawing to a close. No trap last night because the weather was foul; but now things are boding very well for a warmish 24 hours, warm at least by UK November standards. 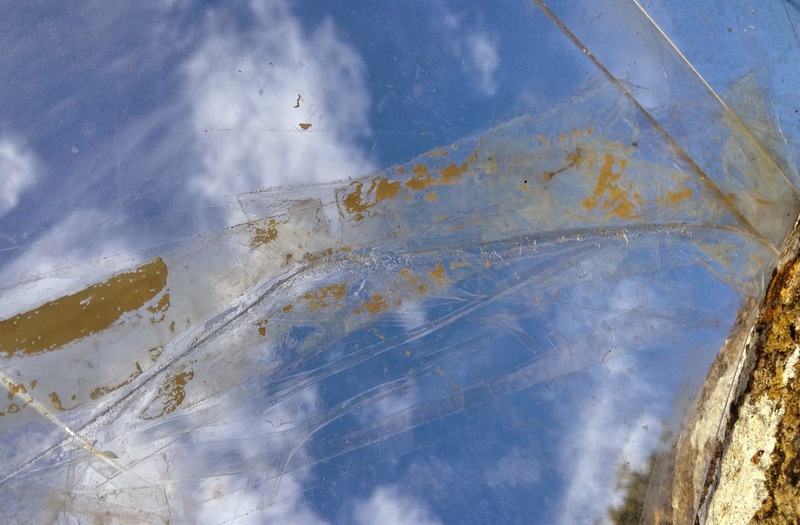 In the meanwhile, I have been doing the equivalent of a fisherman mending his nets because the plastic canopy of the trap has been getting a bit creaky. The whole instrument - a Robinson model, king of moth traps - has lasted extraordinarily well for eight years and is a tribute too to its suppliers, Watkins and Doncaster. I must call it the king and queen of traps, though, because it was designed by Mr and Mrs Robinson, a rare intervention by a woman in the moth world of the 1950s and 60s on which I have often remarked approvingly. Today the trap suffered a second crack, following one at the start of this season which I mended with Sellotape. I have done the same again and let's hope it lasts for a while. So far as the moths go, it may add a welcome bit of distortion and opaqueness to the dazzling mercury vapour lamp; and perhaps an additional bit of camouflage via a broken-up background, as with wartime dazzle. 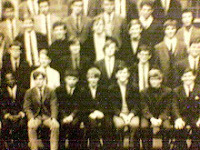 My other innovation is that I found an unblurred photo of my university matriculation and how to substitute it for the old one which I've long used as my blogauthor pic. So that's been done. It was way back in 1968 and I was in distinguished company; one of our year turned into Sir Alec Jeffreys, the DNA fingerprinting pioneer. I wonder if he runs a moth trap, or might have a crack at doing so, if not. Morning photography is a bit of a rush at the moment with rain often falling but the open air the only place to get enough light for clear pictures. Hence I've had little time to think of different ways of looking at the slumbering moths, which can prove quite revealing. This morning, quite by chance, a Sprawler rolled over in its sleep when I tilted its eggbox and revealed this fine yellow colouring to its abdomen. A Lincolnshire Yellowbelly, to be sure. I've added a close-up to show the surrounding fur coat more fully plus the conventional top view, just above. Poor weather conditions also account for the hurried nature of some of today's other pictures but since there were so few inhabitants of the trap, I thought that I would nonetheless show you them all. Here they are, with my best guesses at ID at this early stage of the day attached. I am being called to help with breakfast. Another rainy night but the opposite way round from Sunday with dry, old weather in the evening and a wet, mild morning. Hunkered down in one of my green eggboxes was a welcome visitor, the Satellite, one of the handful of UK moths which spend the winter as an adult. It must be a lonely life for the gregarious specimens, with only December and Winter moths likely to be abroad in the really cold months. The fomer, incidentally, which starred here yesterday, is doubly hardy for it spends its first winter as an egg, hatches, munches and pupates in a leisurely way over Spring, Summer and Autumn, then emerges in its fur coat just in time for a second crack at the nastiest of our famously capricious weather. I tend to think of the Satellite as the Space Invaders Moth because its alien spaceship markings remind me of that infuriatingly addictive computer game. Its companions in a sparsely-populated trap were a couple of Sprawlers, the one illustrated defying the rain on the outside of the plastic shield, a very fine Feathered Thorn, a completely comatose Chestnut - below - and the poor bedraggled chap at the end. I rescued him or her from a pool of water which had dripped past the rainshield and he or she gamely crept on to my life raft, nipped from a piece of eggbox. It's supposed to clear up shortly and I'm hoping that supposition is correct.